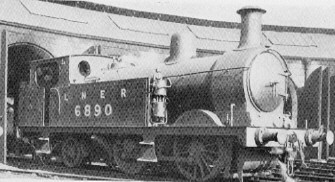 Manson designed a series of 0-6-0T engines (LNER J90 and J91) which were used on the newly inaugurated Aberdeen suburban trains. It is thought that Manson realised the solution was a new 0-4-4T type, but due to a lack of funds this was not realised until the tenure of James Johnson in 1893. These locomotives were influenced by James Johnson's Midland Railway origins. Between 1916 and 1922, all nine members of the class were rebuilt with new boilers. The Aberdeen suburban services were discontinued in April 1937. As this was their only work, six engines would be withdrawn before the end of 1937, one in 1939, and another in 1940. Remarkably, No. 6887 survived as the Inverurie pilot through to 1947. None of the G10s survived into preservation. The last was withdrawn in 1947. SM Models produced an etched kit of the G10 for 7mm scale (O gauge).